At its most basic, philosophy is about learning how to think about the world around us. It should come as no surprise, then, that children make excellent philosophers Naturally inquisitive, pint-size scholars need little prompting before being willing to consider life's "big questions," however strange or impractical. Plato & Co. introduces children--and curious grown-ups--to the lives and work of famous philosophers, from Descartes to Socrates, Einstein, Marx, and Wittgenstein. Each book in the series features an engaging--and often funny--story that presents basic tenets of philosophical thought alongside vibrant color illustrations. 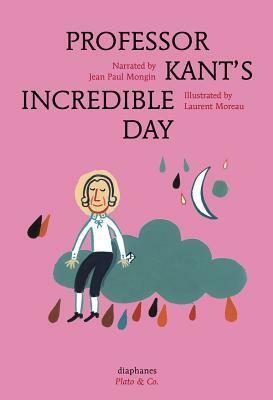 In Professor Kant's Incredible Day, the philosopher Immanuel Kant wants only to be left in peace to consider life's big questions: What can I know? What can I hope for? But, when a perfumed letter arrives one day, it interrupts his studies and sets off a series of events the dour professor could not possibly have predicted. But just when it seems as though all of Konigsberg is plunged into chaos, he realizes that this perfect storm may hold the answers to his most pressing questions. Francoise Armengaud is a philosopher who has taught at the Universite Paris Ouest Nanterre La Defense. Annabelle Buxton is a Paris-based illustrator whose work has appeared in books, newspapers, and magazines. Jean Paul Mongin is a philosopher who lives and works in Paris. He is the editor of the Plato & Co. series. Laurent Moreau is an illustrator based in Strasbourg. Anna Street is the translator for Plato and Co. She is a PhD candidate at Universite Paris 1 Pantheon-Sorbonne and the University of Kent.